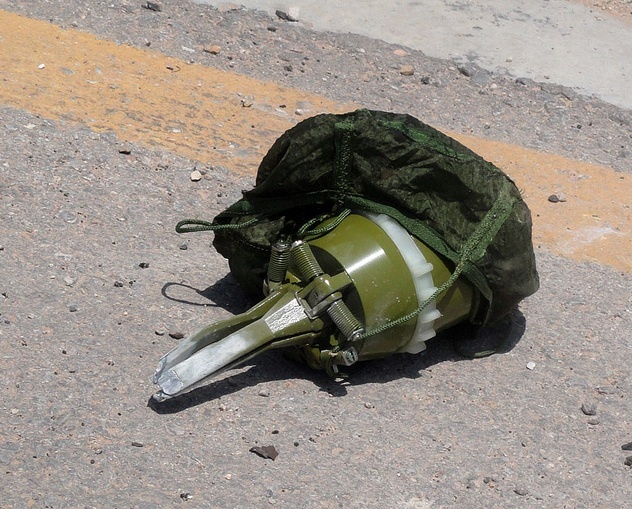 Approximately 20+ explosive devises called smart mines were dropped Â into Misrata harbor and around the port yesterday. Earlier reports claimed helicopters dropped the mines, but C.J. Chivers of the New York Times writes that they were delivered by a Chinese-made variant of a Grad rocket that opens in flight and drops the mines. Still tweets and internet articles persist telling of Gaddafi helipcopters painted white with red crosses to look like International Red Cross, thus avoiding fire from Freedom Fighters on the ground and NATO detection. So far no images have been produced to verify the story. The explosive devices are called ‘smart’ as in meant to be self-destructing and self-deactivating after a set time.Â Mines are dropped, maim, kill and wreak havoc, but are deactivated by time troops sent in. ADAMs is another acronym associated with this type of mine which areÂ Specifically called Aerial Drop Mines or Proximity Mines. Notice parachute andÂ base at bottom that snaps out to brace it upright.Â When it is fired from its pod, three spring loadedÂ arms pop out from the side to its current position as it leaves the pod, thus arming the mine. This also releases the chute. There is some discussion about whether this is a NATO design not used since 1999. Your assessment seems right on the money with Chivers NYT report. One person on Twitter talked Chines type 84 from early on in discussion. Was that you? ps. discussion was thru @acarvin. The money appears to be on the Chinese Type 84 mine, delivery method by 122mm rockets.